Home Crepe Blog Delicious Breakfast Options to Begin 2019 With a Smile! With the beginning of another wonderful year, let’s resolve to start our day by having breakfast to help us breeze through the day’s activities effortlessly. Celebrate the new year and new beginnings with healthy, sweet crepes for your morning meal. Surprise your family with a delicious crepe breakfast! The combination of jam and Nutella can turn a simple breakfast into a feast. A tasty crepe filled with Nutella and jam is the perfect way to start your day. The brown butter in it will create a slightly nutty flavour in the dish, giving it a new spin. You can also add a few slices of your favourite fruits to your crepes to add some flavour and healthiness. You can also use any flavoured jam as most go well with Nutella. Strawberries, being rich in Vitamin C and antioxidants, are a healthy choice for breakfast. Add yogurt to the mix, and you have a healthy and delicious breakfast option. You could also sprinkle powdered sugar on top to make it more interesting. You can get your fill of sweetness with a tasty and flavourful crepe filled with raspberries, sweet Greek yogurt, and a fruity sauce. Raspberries have a fresh sweetness to them and an undertone of tartness, resulting in a perfect blend of flavours. You can also use the raspberry sauce for topping to enhance the taste. Buttery crisp crepes when combined with freshly sliced peaches and caramel sauce give you an amazing breakfast to kick off the day. The low-calorie fruit with its refreshing taste paired with tangy caramel sauce are the perfect ingredients to make a mouth-watering crepe. You could also add in other fruits to enhance the flavours. With a light texture and slightly nutty taste, spelt crepes are delicious when filled with peanut butter ganache and drizzled with chocolate sauce. This is a favourite for kids and an easy way to get them to have breakfast happily. You can also use buckwheat flour which is gluten-free instead of spelt. 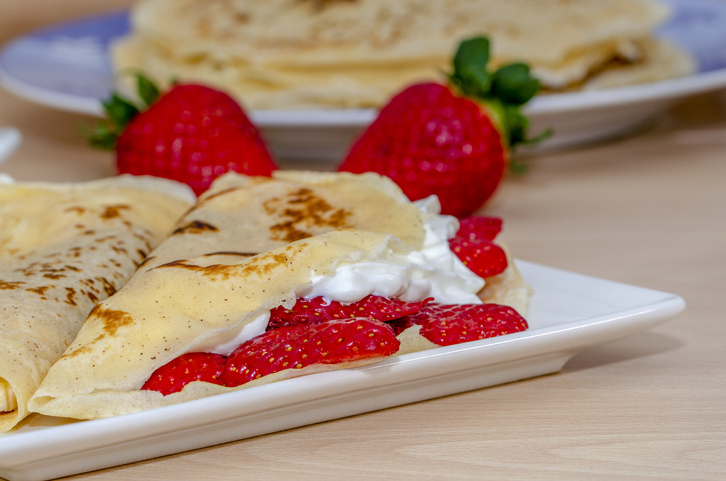 Adding juicy, luscious, and fresh strawberries that are slightly stewed along with buttery mascarpone to buckwheat crepes gives the right amount of decadence without being overly sweet. Instead of mascarpone, you can also use cream cheese and have it for brunch as well. At Crepe Delicious, we specialize in creating crepes that are cooked to perfection. Our healthy crepes are made of the finest ingredients and are a great alternative to fast foods. Come in to sample our sweet crepes and discover your favourite one. We also have a wide selection of savoury crepes that are nutritious and filling. When you wish to have a delicious breakfast, look for the nearest location and visit us today!